Are you having sharp pain in your ankle and cannot figure out why? In your case there is no history of trauma, you are not especially active or athletic but you seem to have ankle pain, mainly on the inside or the outside of the ankle. You may or may not be overweight. You have been to the doctor, perhaps had x-rays, had various types of treatment but still have pain. This discussion deals with one aspect of a painful ankle that most non-footspecialists would fail to recognize. It deals with pain that is the result of nothing more than abnormal biomechanics of the foot. Biomechanics is defined as "The study of the mechanics of a living body, especially of the forces exerted by muscles and gravity on the skeletal structure." More simply stated, it is the way the body functions in regard to the musculoskeletal system. Unfortunately, most of us do not function the way the anatomy books would lead us to believe. There are many variations on the way the skeletal system is “supposed" to function. Most of these variations would be considered normal since there is a large percentage of the population that exhibits these variations. A simple example would be a limb length discrepancy where one limb is slightly shorter than the other. It is abnormal compared to an anatomy text book but normal in that many people exhibit that trait. In regards to the ankle joint, this joint is considered a hinge joint where the talus bone of the foot sits directly under the tibia bone and is anchored on the side by the end of the fibular bone to form the ankle joint. This type of joint allows the foot to move up and down. 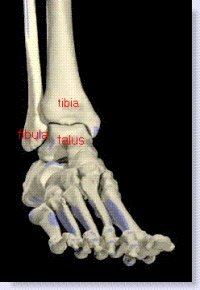 Look at the picture below, notice how the talus bone of the foot sits perfectly under the tibia and fibula bones of the leg. Also, note the perfect space between the talus bone and the tibia and fibula bones; this is an ideal articulation which forms the ankle joint. Under these circumstances, without any history of trauma there would be no complaints of ankle pain. The picture below exhibits a foot that is excessively pronated. The problem with this is that the excessive pronation forces the talus bone to abnormally sit in the joint space. Over time this will cause a premature erosion of the joint, in the same manner that unbalanced tires on a car will cause premature erosion of the tread on the tires. What also happens is that due to the abnormal alignment of the talus bone in the joint, the outside of talus bone will impinge or press into the end of the fibula bone. Note the blue arrow. This will cause a constant jamming and irritation on the soft tissue in that area, primarily the ligaments that attach the two bones (lateral ankle ligaments). The peroneal tendons are two tendons that come down the outside of the lower leg and travel under the lateral malleolus (the outside ankle bone). Because of the over pronation and jamming effect, these tendons can get caught up in the impingement. Typically the outside of the ankle will be swollen as well. Damage to the tendons can be as simple as an irritation, all the way to a partial tear in the tendon. This degree of damage will in many cases respond to conservative care, but sometimes the tear in the peroneal tendon must be surgically repaired. What will typically happen is a patient will present to the office complaining of ankle pain on the outside of the ankle; there is no history of trauma, the patient may not be very active or athletic, but it seems the pain just came about out of nowhere and is a nagging type pain. Many people will also complain of burning on the outside of the ankle as well. The sural nerve is a nerve that also passes just below the outside part of the ankle and this nerve may get "pinched" and will result in a burning sharp pain in ankle. The patient has been to another doctor who prescribed anti-inflammatory medication, possibly gave a cortisone injection, may even have tried physical therapy or even immobilization of the ankle all in an effort to reduce the pain. In most cases the ankle may even have felt somewhat better while undergoing treatment but once the treatment ended, the pain returned. Now, if you are over-pronating and you are jamming the bones on the outside of the ankle, what do you think you are doing on the inside of the ankle? You are doing the exact opposite; you are stretching the soft tissue structures between the talus and the tibia. Note the red arrow in the drawing above. There are two major problems that can occur on the inside of the ankle. The first is a tarsal tunnel. The second major problem is what is known as PTTD, otherwise known as posterior tibial tendon dysfunction. The posterior tibial muscles originates in the back of the leg, the tendon then passes below the inside bone of the ankle, the medial malleolus, and attaches into the navicular bone which is a bone on the inside of the foot. 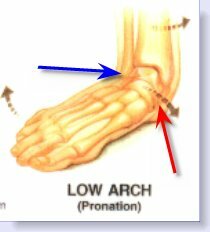 The purpose of this muscle is to support the arch of the foot. In situations where there is too much pronation, the tendon essentially gets stretched out and becomes inflamed, along with losing its ability to support the arch. When the scenario of pain either on the inside or outside of the ankle presents itself, with no history of trauma, the very first thing I ask the patient to do is stand up. If I notice excessive pronation and by pressing into the crease at the level of the skin on the outside of the ankle, or pressing on the stretched skin on the inside of the ankle, that is caused by the pronation, and the patient states that is where it hurts, I am fairly certain of the diagnosis. Treatment is very simple. Reduce or eliminate the excessive pronation. 1. In very minor cases of pronation, a medial heel wedge added to the shoe will force the heel into inversion (the opposite of eversion which is seen in pronation), basically to realign the talus within the ankle joint. This type of treatment is more effective for mild cases of ankle pain. A medial heel wedge can be purchased online, in a surgical supply store, or even a shoe repair store. You just place it under the inside portion of your heel. 2. Another simple solution may be the use of an orthotic. The orthotic is better than a heel wedge simply because it forces the whole foot out of pronation. Keep in mind if you do not feel the support of the orthotic under your arch, then it probably is not helping. 3. A more permanent solution, and one used in more severe cases of pronation (and thus ankle pain) is to make a prescription orthotic with an exterior varus post, which has the same effect as a medial heel wedge, to keep the foot and ankle properly aligned, and to raise the arch to reduce the strain on the tibialis posterior muscle. This treatment works like magic. Within a day or so the patient will begin to notice improvement and over the course of a couple of weeks the pain will dramatically diminish. In the initial stages the patient must wear the orthotics all the time. Some people will wear them during the day, kick off their shoes as soon as they get home and then wonder why their ankle still hurts. Walking barefoot exacerbates this problem, so the orthotics must be worn all the time, from the time you wake up until the time you go to bed, until the pain is gone and then the patient can start going barefoot more frequently around the house. 4. Once the excessive pronation has been eliminated, additional therapies such as physical therapy, or oral anti-inflammatory medication may be supplemented in an effort to reduce the pain in the more resistant and chronic cases. The opposite of pronation is supination and therefore one might think that in excessive supination the opposite ankle symptoms would occur. In theory yes, in practice, rarely. The reason is that excessive supination is rarely seen in the general public, it is much more prevalent in people with neurological disease. Since those with neurological disease affecting the legs tend to exhibit an abnormal gait to begin with it is rare to see someone in that situation come in with just ankle pain. People who have very high arches, cavus type foot, also have a tendency to supinate more but they too usually do not present with the kind of ankle pain discussed in this section.